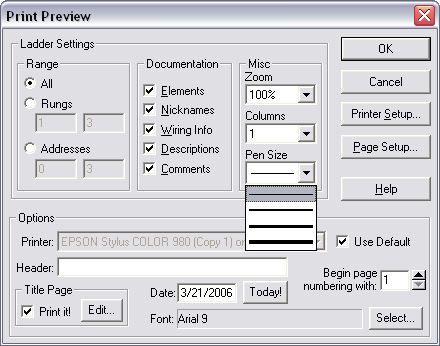 Opening the new DirectSOFT for the first time immediately reveals some new features. 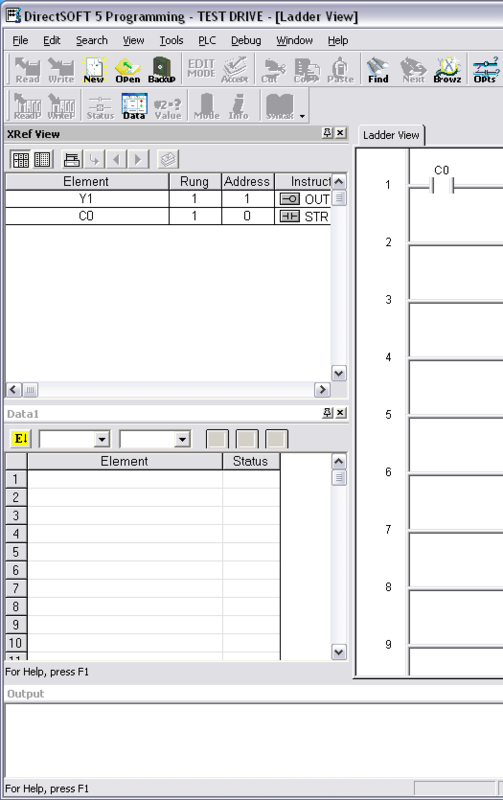 The ladder logic rungs have an even more 3D appearance then before. The first thing to greet you is a tip of the day. 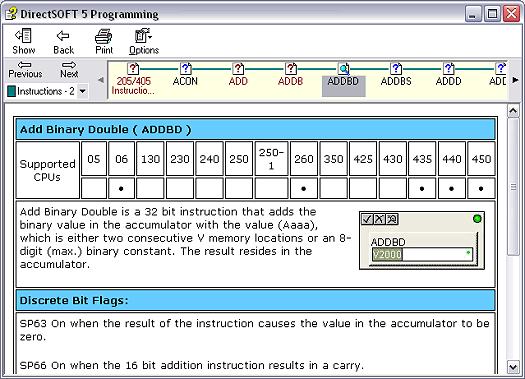 Unlike other programs, there are some neat little tricks which are worthy to read. For easier perusal I’ve made a list of all the DirectSOFT Tips of the Day. Maybe I'll add a few of my own. Am I crazy to think that first impressions matter? Sure it’s the underlying functionality that counts but when you’re trying to win over new users a good slick interface can go a long way. Any good business man will tell you first impressions are important. Unfortunately, DirectSOFT has taken a step backward by changing bad icons for worse ones. They look like something more suited for Windows 3.1 rather then XP (or the upcoming Vista). I would have expected something closer to the Windows Office icons but these are big buttons with the text built right in. I like my screen real estate so I typically switch to smaller icons but they’ve taken that feature out of this new version. The text uses strange letter casings and even misspellings like “Browz”. Many of the icon pictures are not clear such as “Open” or “Opts”. To make matters worse the same icons are shrunk down and used in the pull down menus where they look like pixilated blobs. I may not like the “new” look of the icons but at least I’ve got better control over them now! 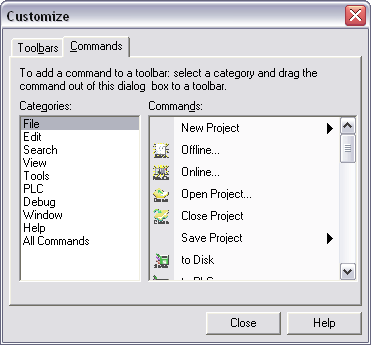 The new toolbars can be grabbed by their handle and docked to any edge of the work area or undocked even outside of the DirectSOFT window. 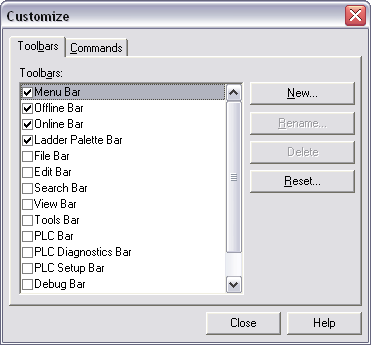 Right click on any toolbar or go to View | Toolbar and there’s a list of many new toolbars that can be turned on our off. Click on the Commands tab and drag and drop any icons to existing toolbars. There’s even an ability to create brand new toolbars by clicking “New”, giving it a name, click on the Commands tab and drag any number of icons onto it. The theme enhances the toolbars and background but leaves the Views unaffected. I’ve compiled screenshots of all the themes so you can be the judge. 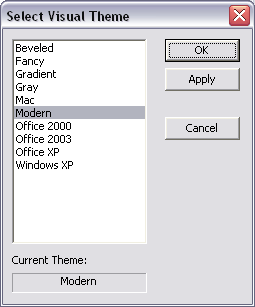 The only one I find appealing is the Office 2003 theme. Some of these themes like Fancy are just plain atrocious while others I can’t even see a difference. Enough eye candy! Let’s get to some more interesting new functionality. There’s been a nice feature added for Views (Cross References, Data Views and the Output window) that give them the ability to be docked or floated. To bring up the Data View go to Debug | Data View | New… and a new data view pops up neatly underneath the Xref View. Do the same for the Output window under Window | Output Window and it pops up in its default location at the bottom of the screen. Changing the placement of a view is really flexible. Do a quick double-click on the title bar and it pops out into a floatable view. Click and drag it’s title bar and move it around the screen to dock it in another position. Gray borders indicate where it will dock once it’s dropped. 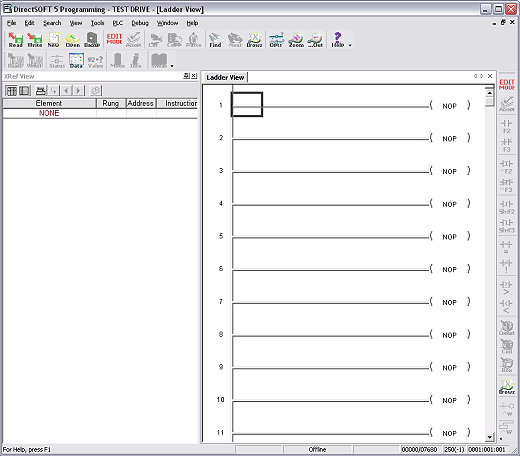 Drag it over the title bar on another view and it will create a tabbed look like Excel. Don’t worry if things get all mixed up because you can select Window | Default Layout… to set it back to the original layout. Hopefully in the future there will be a way to save different layouts and call them up when needed. The push pin in the top right corner of the view is also a nice feature that allows the view to auto-hide. Push the pin and the tab goes on the side of the window. Float your cursor over the tab and the window slides out. Move the mouse to another part of the screen and the view slides back. Very nice. The main views (Ladder, Stage, Mnemonic, PID, and Documentation) also have a new tabbed feature. This new feature is really not that helpful above the common Windows way of switching between the main views. Using Ctrl+Tab is really the quickest way to do this. The tabbed feature is simply taking up some more of my precious screen real estate. I often find myself switching between the Ladder and Documentation Editor so it would have been very helpful to have the Documentation Editor as one of the other Views that can be docked beside the main view. It’s not a big deal though as you can still Cascade and Tile the main views just like before. Another small change for the better has been moving the Online Status Bar to the actual primary status bar. The Online Status bar always seemed to have a problem staying put in DirectSoft4 but this will definitely fix that problem. Even nicer is that they are actually buttons that bring up the appropriate dialog boxes. The real crowning achievement of DirectSOFT5 is the intelligent boxes conveniently referred to as IBoxes. If there was any real consideration of upgrading then this would be it. The only CPUs to support it are the DL05, DL06, D2-250-1, D2-260, D4-450 and they must have the correct firmware version, freely available for download on the Automation Direct website. What was once impossible, obscure, annoying or took many rungs to accomplish can now be done by simply filling in the fields of an IBox. There are 66 of these boxes broken down into six categories. Anyone who’s had to do some of these setups will appreciate the simplicity now in programming with IBoxes. The Move Word Ibox means no more accumulator worries with LD V1000 and then OUT V1001. An off timer, on timer and a one-shot. Simple stuff to implement but it makes it so much more obvious for the newbie. A Push ON / Push Off circuit (otherwise knows as alternating contact). I usually did this with a nifty XOR trick put I’ll be using this from now on. The Analog Helper IBoxes are a real welcome sight. In the past, configuring the analog cards was an exercise in getting out the manuals and figuring out what values went in what registers, setting up some rungs to scale it, filter it if needed, and set alarms points. There’s now IBoxes for all this functionality. The real crown jewels are the Math IBoxes. They make it easier to convert between different formats, perform a square, sum a region of registers and even calculate formulas. With the likes of the MATHBCD box the days of setting up temporary registers and loading in and out calculations to get a final number are over. The MATHBCD, MATHBIN and MATHR boxes except complex formulas like you would do in Excel with parenthesis, V memory and functions. The majority of the IBoxes are in the Communication category and rightly so. Many of those are dedicated to the new ECOM100 Ethernet communication cards. They help to configure, read information, control reading and writing and even sending email. I find it impressive that the RX Network Read and WX Network Write boxes utilize built-in interlocking with the other network IBoxes to insure proper communications. Sending of email is a real neat idea that could prove very useful. The body of the message uses the same format as the PRINT command so it can be a mixture of text and V-memory values. To round it out there’s a slew of boxes to help with setting up and running the high-speed Counter Modules (Hx-CTRIO). Like the analog setup it’s a real time saver from setting up all the rungs and making sure the parameter settings are correct without having to look it up in the manual. I like that DirectSOFT pays attention to the help files. They’ve improved it. There’s a dropdown box to quickly go to sections and a bar across the top to click on the intructions or functions. I especially appreciate the supported CPUs box. It makes it a real easy read like their excellent manuals. I haven’t seen it mentioned as a new feature but I like the way the list of available instructions drops down as you type. Export Data Views to a CSV file for later viewing in Excel. 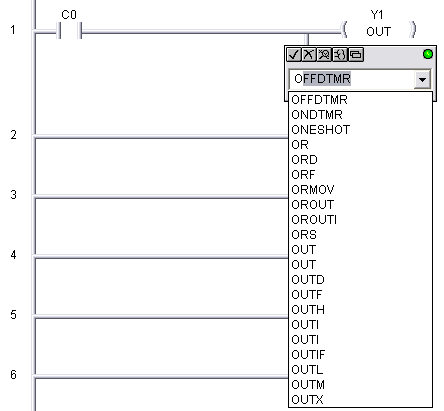 This gives a snap shop of the data view with values. I’ve never felt the need for this but I suppose it could come in handy. 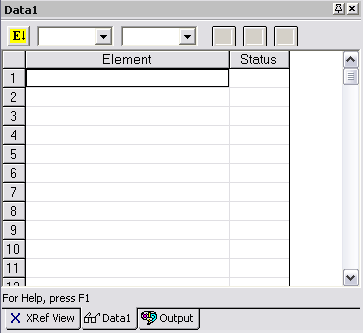 Just right click on the Data View and select Export | All or Selection. Support for the new D0-DCM module which adds the capabilities of two more serial ports to the DL05 and DL06 PLCs. 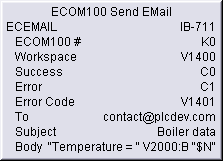 Along with the new ECOM100 modules these little PLCs can be quite the communicators. Printing now has the selection of Pen Size if you’re having trouble viewing the rung and stage lines because of a printer’s high DPI resolutions. If the above features haven’t convinced you to upgrade there’s still one other important consideration with the way AutomationDirect is now selling DirectSOFT. It used to be that there was a software package for each PLC model so the price to program a DL06/06/105 was $149, the DL205 was $199, the DL405 $199 and the full package to program all of them was $495.00. Obviously there was an advantage to this if you only programmed a DL05 but if you also used a DL205 you might have to maintain two different licenses or buy the full package. The way AutomationDirect has set it up now is to not offer the single packages anymore, reduce the price for the full package to $395.00 and provide a simple upgrade path for any existing DirectSoft software (no matter what version). To upgrade to the new DirectSOFT5 full version is $179.00 (this will last for a 90-day introductory period after which it will be $249). Compared to other PLC software packages this is a great deal! This means that even if you have the DirectSOFT Release 2 for the 05/105 and you upgrade to Release 5 you end up with the full blown package that supports all the CPUs. Also notable is a change in the demo software which now supports all the PLCs and allows for 100 words or less (up from 10) to be downloaded to a PLC. Unfortunately you cannot open or save a program over 100 words. So basically if you have a very very simple application you can use the software for free. It’s obvious that AutomationDirect and Host Engineering, the programming company behind DirectSOFT, are really listening to their customers and making great improvements to DirectSOFT. The attempts to make DirectSOFT look better with new icons and themes really hasn’t paid off. Where the new software really shines is the ability to manage views and the new intelligent boxes. Some great new functionality is there and that’s what really counts. With the introduction of IBoxes and the remarkably nice upgrade path it makes it a cinch to recommend existing users to upgrade to DirectSOFT5. Submitted by Jeff Payne on Fri, 2006-03-24 10:50. That has to be one of the most thorough evaluations of a new product I have seen. You hit every major point of interest that were new for version 5.0 and gave your honest opinion. What more can you ask? Submitted by mercedesbenz (not verified) on Fri, 2011-05-27 18:57.